In the 1920s clothes became a defining mark of who and what people were. Then, as now, fashion and what someone wore defined who and where they belonged in society. Women's clothes in the 1920s were under heavy scrutiny and criticism from the feminists of the generation, who felt the revealing flapper style dresses were undermining the hard work of the suffrage movement. '20s feminists saw the ratification of the 19th amendment as a huge step in the right direction, but saw the "frivolity" of the flappers as a slap in the face and a threat to the equal rights they had worked so hard for. At its core, fashion is political. The 1920s were no exception because the fashion of the 1920s was a revolution. "Her [the flappers] struggle for equality and success, is reflected in the garments she has worn." For better or worse, women defined themselves with their clothes. 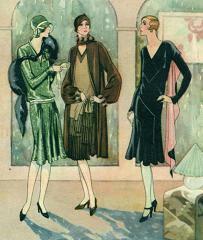 What made 1920s clothes different was that they were available to every women who wished to wear them. The reason was simple: they were readily available to the "regular" woman because of the ready-to-wear revolution that appeared as a direct result of the automation of the Industrial Age. Machines were making clothes faster and cheaper than ever. This was exacerbated by the fact that the clothes were growing smaller as a result of women wanted to show more skin. The Rise of Fashion. . . On the Farm? "Fashion does not exist until it goes into the streets." 1920s fashion made this happen in a big way. Not only were the elite fashions of Paris, London, and New York being rapidly reproduced by lower cost department stores, but the mail-order catalogs like Sears were bringing low-cost high-fashion to the rural farms and outposts of the Midwest. The clothes of the 1920s democratized fashion. No longer was it easy to distinguish a "high-class" girl from a "Midwestern" girl straight off the farm based on her clothes. Thanks in large part to Coco Chanel's advances, regular women could "walk around like millionaires." 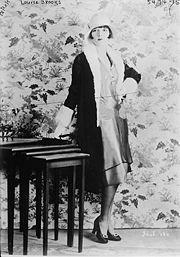 And the more you study them the more you realize how 1920s clothes influence modern fashion today.